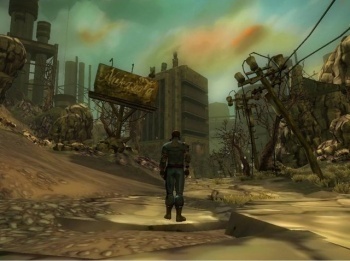 First Screenshots From Fallout MMO? Polish website Polygamia.pl claims to have gotten its hands on the first batch of screenshots from the Fallout MMO. According to Polygamia.pl, the collection of shots were submitted as evidence in the court case between Interplay and Bethesda on which company owns the rights to make such a game. The seven shots on Polygamia.pl are a mix of screenshots and concept art and they depict a bleak post-apocalyptic world, which is expected. There are no details shown of the user interface or actual gameplay, so it is hard to determine just how far along the design process is. I assume that these shots were brought before the judge to back up Interplay's claim that yeah, we're working on it. See? It is unclear how Polygamia.pl acquired the shots, or why the name of website sounds as if it is about being married to multiple partners. Let me be completely clear, these shots could be fake. They are from an unfamiliar source and, if they are from official court documents, I question how a heretofore unknown Polish gaming website was able to obtain such highly sensitive materials. That being said, they seem to be at least well-made fakes and match up with previously seen concept art. Are these screenshots real or cleverly made facsimiles from Eastern Europe? You be the judge.